Early last December at the Disciples Seminary Foundation (Claremont, CA), one could almost hear minds churning with deliberation. A room full of seminary students individually arranged seven index cards, respectively asking the questions when?, where?, why?, how?, what?, who?, and how much?–pertaining to the decision to start a church or nonprofit. Participants toiled over the proper order of importance while filling the walls with masking tape, holding vertical lists and other geometry non-conforming shapes made of the cards bearing these question words. 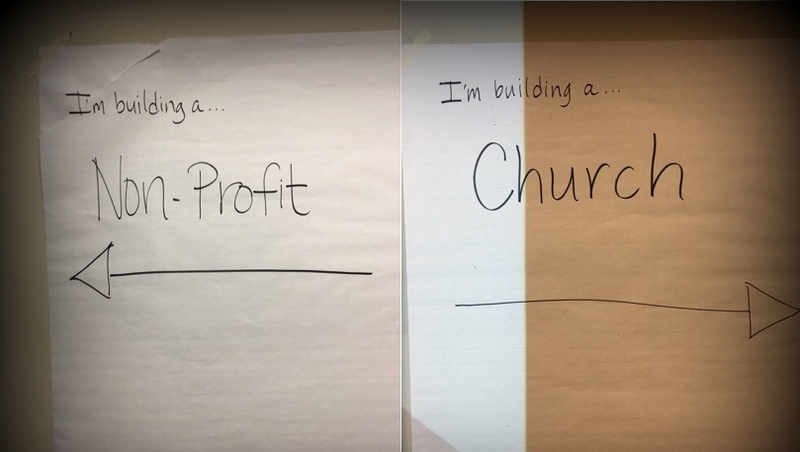 This was a key exercise in a workshop collaboratively offered by Hope Partnership for Missional Transformation and National Benevolent Association of the Christian Church (Disciples of Christ). The workshop, entitled “Should I Start a Church or a Nonprofit?”, was led by Pastor Terrell L. McTyer, Hope Partnership’s Minister of New Church Strategies, and Rev. Ayanna Johnson Watkins, Director of NBA’s Incubate Initiative. The goal of the workshop was to foster space for participants to prayerfully explore the questions associated with starting a new ministry and to provide information about how Hope Partnership and NBA might support their efforts. The staff of Disciples Seminary Foundation (DSF), among them President Jon Berquist and Director of Student Life Jo Ann Bynum, offered their building and continuing education credits for Claremont School of Theology students to participate. 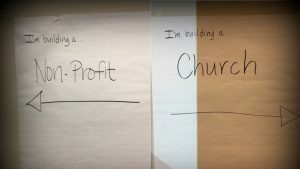 The seminarian participants represented a mix of entrepreneurs considering church planting, social enterprise, or some creative blend of the two. They were passionate about serving immigrants, children with autism, and religious outcasts, as well as working on issues related to addiction, food justice, arts as a method of healing, and more. And as they wrestled with questions of who they might serve, how they might build a new ministry, and neighborhoods in need, it became apparent to us all that the future of ministry is full of promise. The work of the Incubate Initiative and New Church Ministries intersects in a unique place where the future of the church and ministry is being reimagined. Here we can empower Disciples to begin building the things they believe the world needs and turn their “I wish someone would…” into “I believe I will.” Both Hope Partnership and NBA are working to identify Disciples with dreams and ideas to better serve God’s people while equipping them with the skills and resources to make those concepts a reality. Hope Partnership provides preparation for developing ideas, identity, and infrastructure to guide courageous leaders. NBA provides training and resources for building a health and social service ministry/nonprofit, including guidance on infrastructure, legal matters, marketing, and development for those Disciples building new social enterprises, in addition to coaching and peer support. At the end of the day of discernment, despite being surrounded by the cacophony of question words taped to the walls, participants overwhelming said they felt clearer and more equipped to make good decisions about their spiritual vocation and call. You can experience an abbreviation of this workshop through the Transformative Leadership and Innovation learning track at the 2017 General Assembly in Indianapolis, IN, taking place July 8-12, 2017. Originally posted on the NBA Incubate Social Enterprise Resource Bank.